Love’s Trillium CNG has finalized an agreement to bring two CNG facilities to south Florida. According to the Alternative Fuels Data Center, the stations will be the only CNG locations in Miami-Dade County. The county awarded Trillium the contract under which the company will design, build and maintain the facilities, upgrade maintenance facilities, as well as procure 300 CNG buses for the county’s public transportation system. The stations will serve approximately 250 Miami-Dade County buses each. Trillium has contracted with New Flyer to provide the first 300 CNG buses. The 40-foot Xcelsior CNG buses will be delivered throughout 2017 and 2018. The agency may add CNG buses in the future. The Miami-Dade County Metrobus system provides service along 95 bus routes that travel 29 million miles per year throughout the county, including parts of Broward County and the Middle Keys. “As mayor, it is my responsibility to seek the best possible future for our children and grandchildren from both a financial and environmental perspective, and I believe compressed natural gas and renewable natural gas for our county’s buses will move us towards that goal,” said Carlos Giménez, Mayor of Miami-Dade County. Both locations will have separate fueling islands for the public. Construction on the first facility is slated to begin later this year and open early next year, and construction on the second station is scheduled to start this winter and be open by summer 2018. 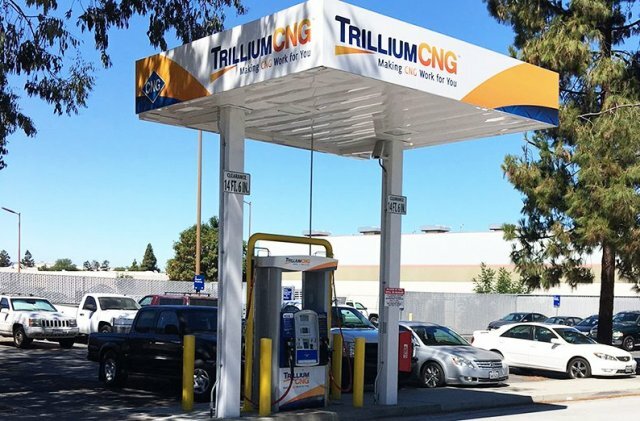 Trillium will provide the fuel for both stations, with a minimum of 20% of the fuel will be biomethane. The agreement also includes CNG-related updates to existing transit maintenance, new fueling buildings, bus washes, and a 10-year operation and maintenance agreement.